April 2010 Archives - mudd up! 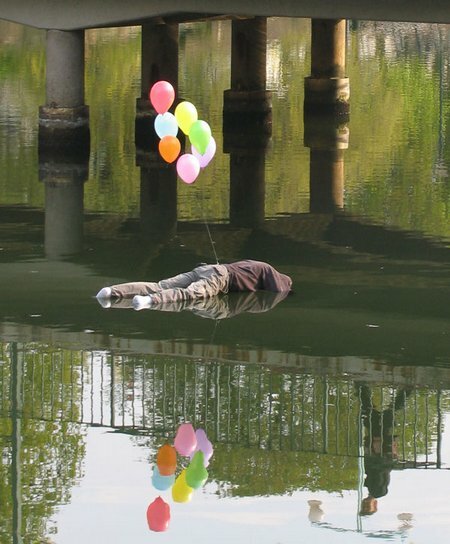 A quick note to say I’m working on Some Stuff for a 3-city interactive art/design festival in France curated by Mark Jenkins, whose artwork this is. Details “soon”. It happens July 2-10 in Bordeaux, Royan, and Pointe du Médoc. Vive La France! It is a sad and beautiful world. People die, absence happens, tiny ants eat through wood and houses fall down. Our task: to take care of ourselves. to remember everything. to open the hand. to listen. Music helps, even when words escape us. 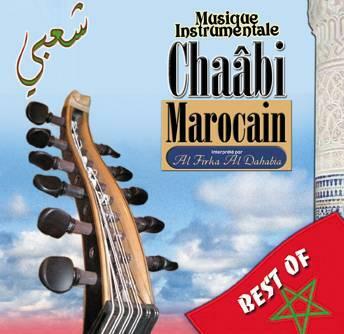 These two tracks come from an excellent album, Chaabi Marocain. I love Moroccan chaabi for many reasons, sliding violins and rhythms whose complexity is social, requiring multiple players interlocking, structures of more than one. Listen to the way that in the first song (this is two tracks on the CD, which is a nonstop medley) a 4/4 beat accelerates into the polyrhythm around 33 seconds in. Life is good. Irrepressibly so – how can you not be moved? We dance, we die. The melody from the second one versions a song – a wedding song if I remember correctly – called 55 in Arabic, a word I write as Hamza Hamzin, weird oral fragments transliterated into Castillian Spanish: they way I learned them. To step towards a language, a tongue, a body. To be gentle with what we love. To dance. Magic numbers painted on a shuttered storefront. Underneath the pavement, the beach! But underneath the beach, more pavement. Life’s line – the space of possibilities – is thin. To burn these minutes in a useful way. If you can’t count out the music let your body, it can. The songs stop abruptly because this is a medley; they are not supposed to stop. I’m playing in Washington D.C. tomorrow, Saturday April 17. First time in Distrito Federal! It’s a Dutty Artz thing: Matt Shadetek and Jahdan Blakkamoore are coming down with me & we intend to shake things up. Info. My latest article for The National can be viewed online here. 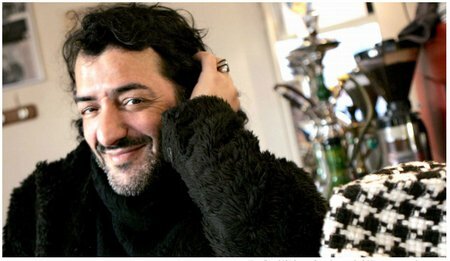 I look back at the career of Rachid Taha. To call him a rock star is to overlook his success in the Arab world as an innovative reinterpreter of rai and chaabi. To label him a pioneering figure in Arab-technopop is to forget the long shadow cast on him by The Clash and other spiky political rockers. And if he’s a rebel, then why all the lush, respectful cover versions from decades past? Bomb magazine just published an in-depth interview with me. Poet Alan Gilbert asked good questions. I did my best to answer. AG: …How does your more recent obsession with cumbia fit into this? AG: You mentioned reggae, but I feel as if dub—whether earlier in your work with reggae and dancehall or more recently with dubstep—is the one constant I see in your music over ten years or more. Is that because you’re a DJ and that deep bass sound gets people moving? JC: It’s definitely the constant and probably the music that has impacted me most. Why is a good question. When I’m doing a live DJ set, dubbing is a way to be impressionistic with sound. You can take some Armenian flutes, pitch them so they match the main track, put them through a bit of delay, and suddenly have them rhythmically related to the beat. It’s almost like a means of painting in sound. JC: Exactly. I’m always trying to avoid dub clichés. Dub isn’t a heavy-handed bass line or some person pounding drums like a rock musician or anything that sounds like “reggae,” but more of a way of thinking, of cracking songs open and having the edges bleed together. AG: I want to touch on the noise question again for a second. In the essay “Confessions of a DJ,” you write, “The DJ’s job is to make disparate records sound like a whole. DJs have to work to avoid silence and make things appear seamless.” One of the things I’ve always liked about your work is how you also have an opposing tendency to make a mix sound abrasive, how you avoid the easy groove for any extended amount of time. How does the DJ’s requisite seamlessness interact with dissonance and noise in your work? You’ve written about how important it is for you to sense what the crowd is responding to, but, at the same time, I feel as if you’re consciously looking for dissonance within the overall experience as a kind of conceptual decision. JC: Definitely. 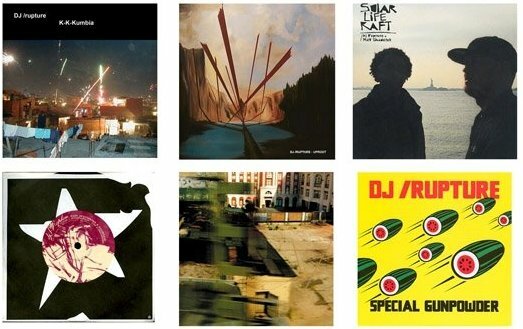 I chose the name DJ /rupture because Boston DJ sets at the time were very horizontal and dynamically flat. They’d be playing the same music and not even interrupting it! (laughter) To me, playing varied music and not allowing for an easy smoothness has always been important. I’m very interested in moments of blowout, moments of rupture—jumping from music to pure sound and texture or moving from melody and rhythm into sheer volume and dynamics. In live situations, there are often moments where I’m trying to get the sound system to feed back or totally saturate the mixer. My friend Kevin Martin, aka The Bug, played at one of Barcelona’s biggest clubs a few weeks after I did. 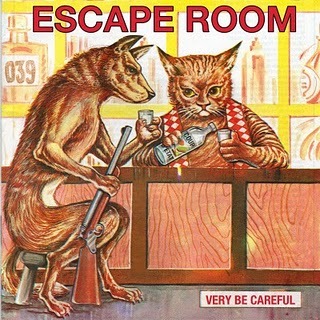 They told him that I’d blown out the speakers; they never said anything to me, but I never got invited back. (laughter) The logic of DJ music is that the beat must go on. But no, the beat doesn’t have to go on. We can shoot the beat and let it die. In terms of the audience, I’m encouraging people to react differently. Those noise moments don’t have to be extended, they don’t have to be frequent; it’s not about being abusive. It’s about other possibilities, stepping into them and going elsewhere. 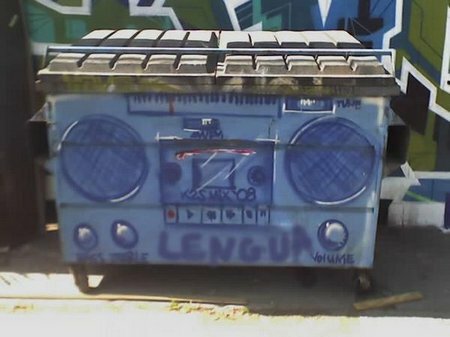 Today on Mudd Up!, 7-8pm, WFMU, we will be airing an exclusive all-vinyl mix from Los Angeles’ DJ LENGUA! It’s cracking, full of latin crate-digger gifts, visionary cumbia, overdriven Colombian psychedelia, and more. For an intro to Lengua, check his rebajada-style Mota mix or this nice interview… and tune in tonight. In a few weeks DJ Lengua will be joining us in-studio for a live interview to discuss the music and his participation in the Museo del Barrio’s Phantom Sightings show. 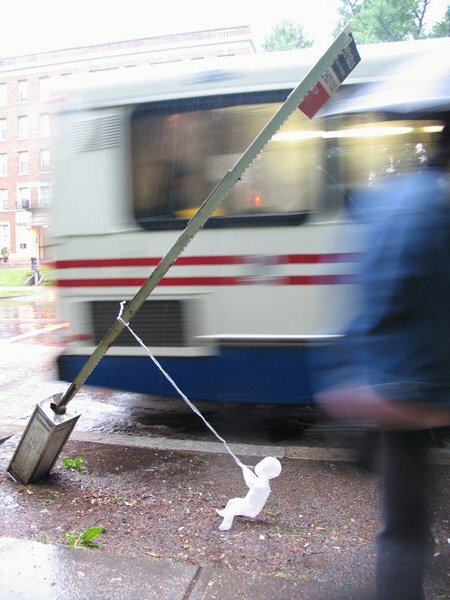 Mixtape on DIY (Do It Yourself) Public Space-Making. Sat April 10, 4-6pm. @ Superfront, 1432 Atlantic Ave., Brooklyn. Discussion panel with Cristina Goberna (Fake Industries | Architectural Agonism), Justin Moore, (New York City Planning, Brooklyn), Ena McPherson (Parks, Arts & Culture, Community Board 3), Jordan Seiler (New York Street Advertising Takeover), hosted by DJ /rupture and Mitch McEwen (SUPERFRONT). Choose to participate in 1 of 3 teach-ins after the panel: 1) community zoning basics 2) spring gardening tactics 3) property disobedience and public dialogue. $5 suggested donation for the 4pm panel and workshops, but no one turned away. I’ve been collaborating with Mitch McEwen of Superfront on a series of projects combining architecture, audio, and public space. Things kick off today with a FREE presentation by Mitch, myself, and other Superfront folk at the Studio X space in Manhattan. Mitch is a next-level thinker, directing the interdisciplinary Superfront in both its L.A. and Brooklyn locations – she’ll be talking out recent curatorial projects and what we’re cooking up for summer. 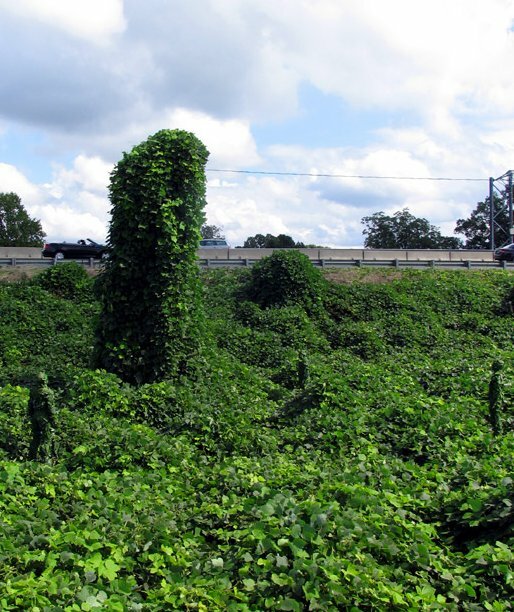 ….and how everything ties in to 2 panels/workshops which Mitch + I will co-host at Superfront along with some stellar guests in the coming weeks: Mixtape on DIY Public Space (April 10), Mixtape Architecture as Activism (May 1). Did I mention the whole thing will culminate in the creation of a community structure for summertime use in Superfront’s 1000 sq. ft. Bed-Stuy backyard? 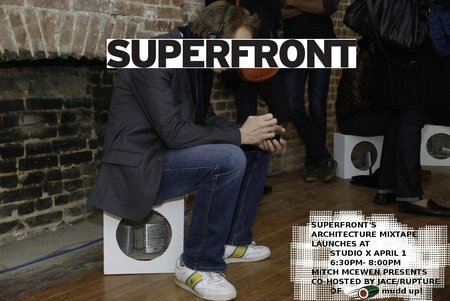 SUPERFRONT’s “Architecture Mixtape” series launches at Studio X, co-hosted by JACE CLAYTON aka DJ /rupture of mudd up! radio. MITCH McEWEN, Founder and Director of SUPERFRONT, presents recent exhibits curated in both SUPERFRONT’s Los Angeles and Brooklyn galleries. The audience will be invited to participate in a public program that integrates music and community organizing into the production of architectural discourse. Catalog publications and the DJ /rupture-produced soundtrack will be on display.